For many months I have been looking forward to the 19th May when we would surprise the boys by taking them to an epic live show. 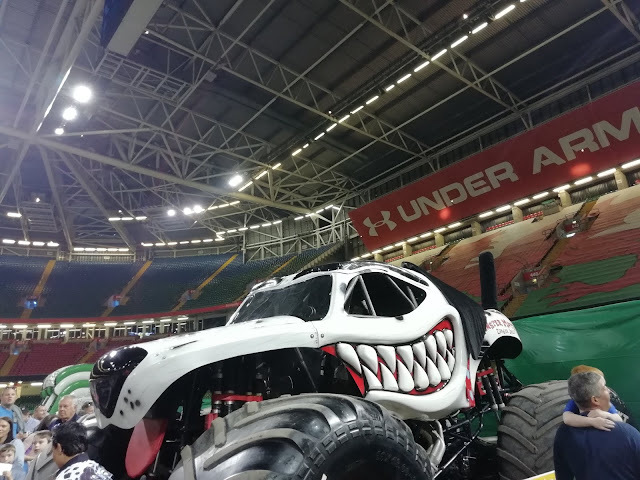 Way back in October last year I wrote about how Monster Jam® trucks were roaring their way to Principality Stadium in Cardiff. Both boys love monster trucks especially Monster Jam® trucks. They adore watching Monster Jam® action online and have an impressive wealth of knowledge about the different trucks and drivers. They love playing with their Hot Wheels Monster Jam® trucks; creating ramps for the trucks to fly over, crushing Hot Wheels cars and displaying impressive mid-air stunts. 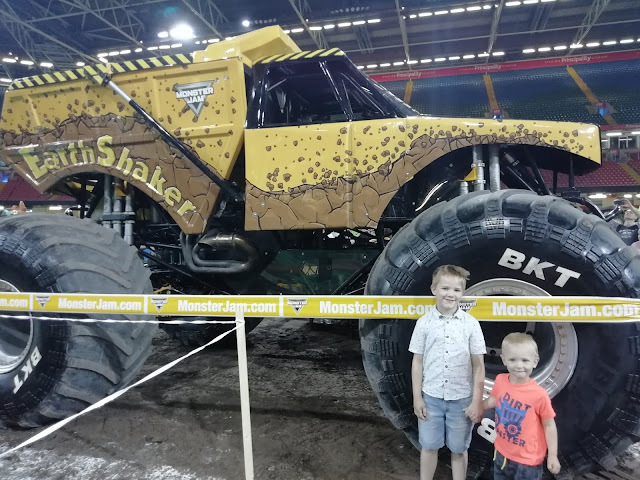 As they are huge Monster Jam® fans I jumped at the chance to take them to see Monster Jam® in person. 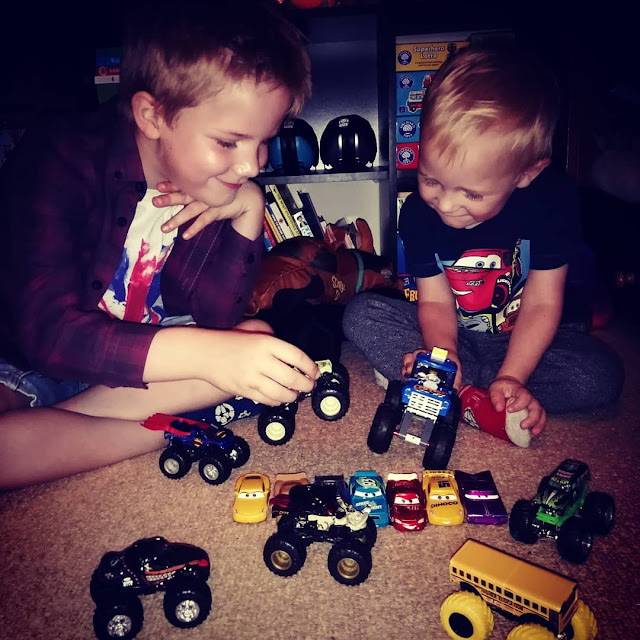 With the big trucktastic day nearing I made sure to brush up my own Monster Jam® knowledge to impress the boys, learning all about the iconic trucks and their brave drivers. 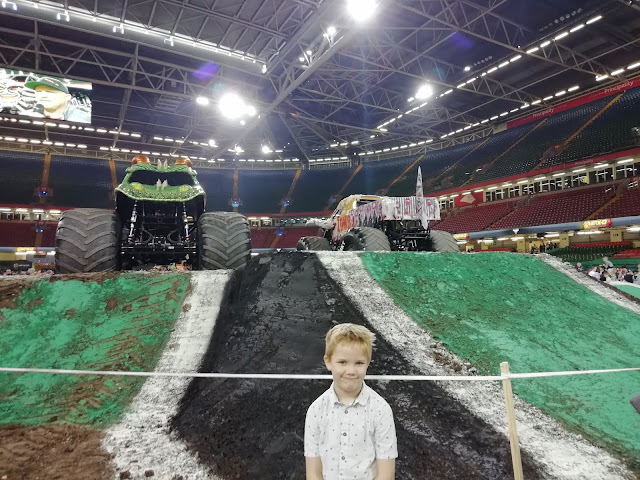 Fast forward to the Saturday the 19th of May and we headed to the Welsh capital to visit the legendary Principality Stadium where we would watch 10 world-famous Monster Jam® trucks compete against each other for the event championship. Dragon™ - Jon Zimmer, Max-D™ - Neil Elliott, Monster Energy® - Todd LeDuc, Grave Digger® - Morgan Kane, EarthShaker™ - Peter Nyman, Zombie™ - Alx Danielsson, Monster Mutt® Dalmatian - Candice Jolly, Megalodon - Alex Blackwell, Scooby Doo™ - Linsey Read and El Toro Loco® - Marc McDonald. I love that both men and women compete against each other for the same championship. Not only does it provide equal rights for women but I think it is brilliant that children can see equality and that both genders can be awesome and achieve their dreams. I love that in this sport my kids have role-models of both men and women who are equally talented. As we neared the stadium for the Pit Party and saw fans adorned in Monster Jam® apparel and the official merchandise stall outside selling all things Monster Jam® it dawned on the boys where we were headed and that they were going to see monster trucks in action rather than from behind a screen. Entering the stadium the boys were bubbling with excitement at the prospect of seeing Monster Jam® trucks in real life. The Pit Party where fans can get up close with the enormous trucks and have a chance to meet and have photos with the drivers was packed with fans of all ages. Walking on the track where the trucks would drive on later that day was surreal. Seeing the sheer scale of the ramps and the perfectly crafted track it was apparent that preparing for this one day live show was no mean feat. 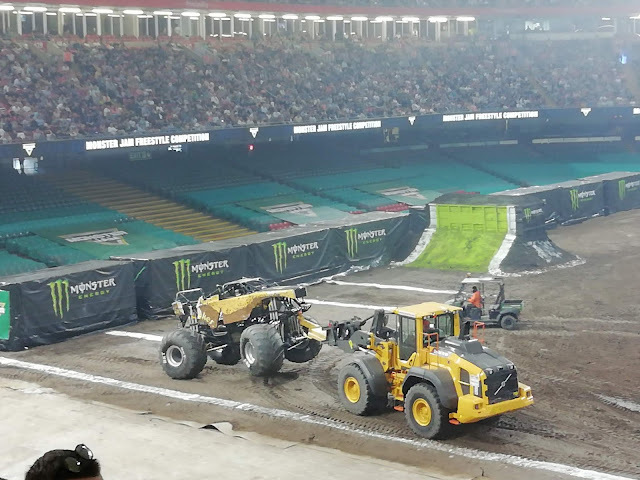 In fact it takes 1,500 hours to build and remove the track, 300 truck loads of dirt to create the track and 113 litres of paint to paint the track. 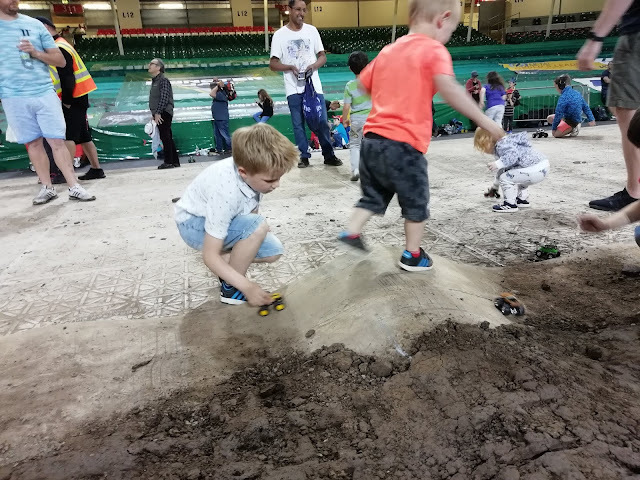 As the boys chatted about what monster truck action they would see later, they joined in with a few other children playing with their own Hot Wheels Monster Jam® trucks on the dirt track, making their trucks soar into the sky. The atmosphere was fun and family friendly. The Pit Party was amazing, getting to meet the drivers was incredible. The queues to meet the drivers were incredibly long and unfortunately we did not manage to meet and get autographs from all of them. But with this being the only UK date on the 2018 World wide tour it was no surprise that so many fans were excited to meet their heroes. All the drivers were friendly and down-to-earth and it was lovely to see that the stars love their fans. Seeing the humongous trucks up close was unreal. The boys were in their element. 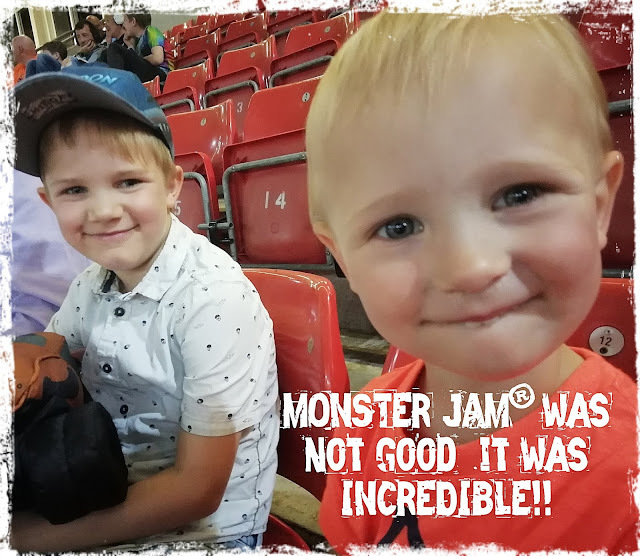 It was a dream come true for them to see the magnificent Monster Jam® trucks. The decoration on the trucks was superb. I truly admire the custom work that goes into creating the fibreglass body which needs more than 40 hours of paint time. Each truck has its own style and character. Monster Mutt Dalmatian with spots, dog ears, tail and wagging tongue. Fire breathing Dragon with impressive horns. Ferocious Max-D with spikes and distinctive face. Megalodon a fierce shark with sharp teeth and fins from the prehistoric era. Zombie with his bloody arms extending from its bonnet. Iconic Grave Digger with its classic spooky purple and green graveyard design. Standing at approximately 10.5 feet tall, 12.5 feet wide and 17 feet long with 66 inch diameter BTK tyres the trucks were a sight for sore eyes. 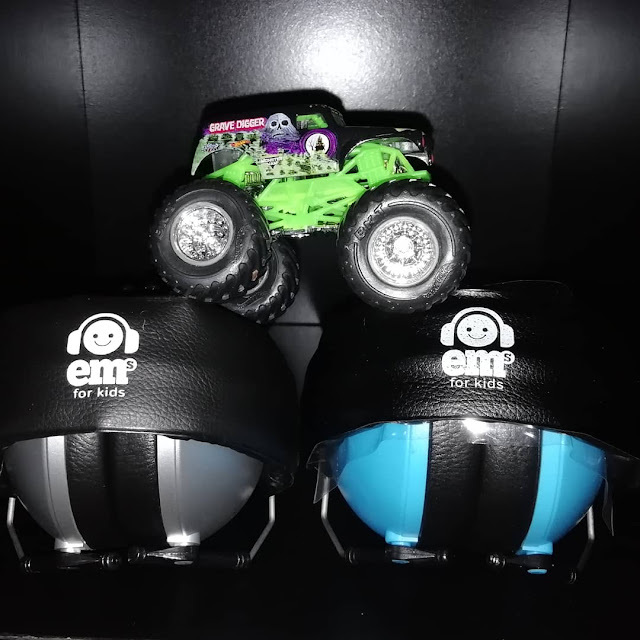 The Monster Jam® trucks commanded attention. The amazing artwork and striking size of them had us flocking to admire them all. 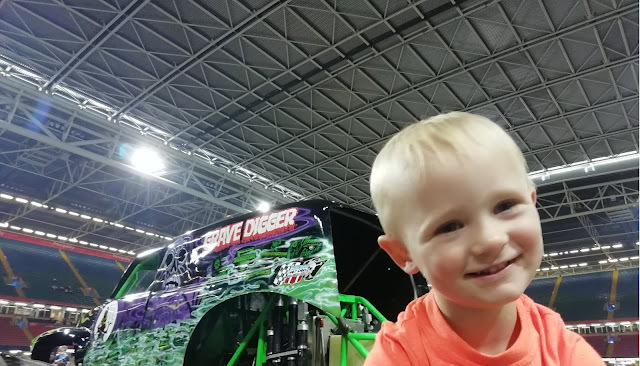 Following the incredible experience of the Pit Party where my youngest was over the moon at having seen and touched the real Grave Digger we had some food and headed for one of the number of official merchandise stalls to buy some more Monster Jam® products. As expected the queues were immense and unfortunately a few items we wanted to buy were sold out on the particular stall we went to and the queues were too daunting to try any others. We returned to the Principality Stadium where the staff were helpful and professional an hour or so before the start of the show. Having expected a long, boring wait until the beginning of the show I was pleasantly surprised. Hosts Keith Jones and Diana Reed entertained and delighted the waiting audience with quizzes, talks with drivers and lovely dancing where one enthusiastic dancer in the audience wowed on the big screen which added to the excited atmosphere. The boys were impressed with Grave Digger driver Morgan Kane's interview where he dazzled with his football skills and kicked a signed football into the audience for 1 lucky fan to catch. 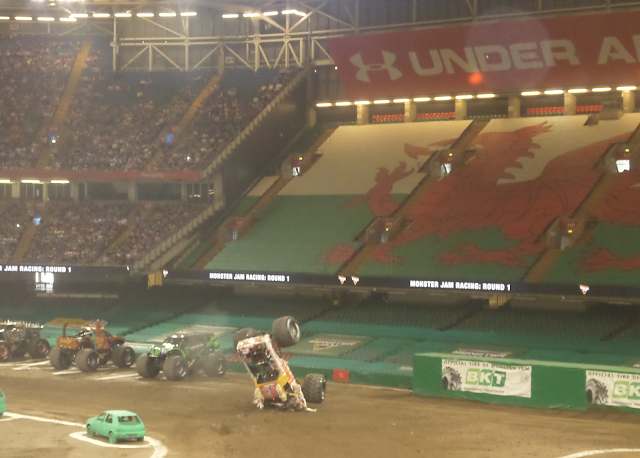 Then the lights dimmed and a spectacular light display kicked off the live monster truck action. The atmosphere was electric as the 10 iconic Monster Jam® trucks roared onto the track. The live show was split into 4 sections - racing championship, two-wheeler skill challenge, stunt motorbikes and freestyle competition. Kicking off the action was the racing round where pairs of trucks went head to head whizzing around the track at monster speeds to be the first across the finish line. The knock-out rounds of racing continued until the final race where 2 trucks competed to be the winner of the racing championship. 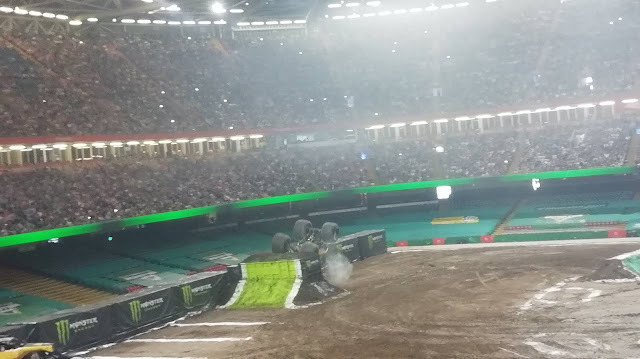 Monster Energy suffered from mechanical problems and could not continue in this part of the show and Zombie crashed and had to be helped out of the arena by forklift trucks. The astonishing thing about the racing was how quickly the trucks were. With engines that produce 1,500 horsepower and speeds of up to 70 miles per hour the trucks roared around the track so quick and raced over ramps it was nearly impossible to capture a photograph of them in action that wasn't a complete blur. The racing was nail-biting action and some of the races were so close that referees and big screen slow-mo action replay has to be called up long to announce a winner. Emerging victorious after defeating Dragon was Earthshaker driven by Peter Nyman. 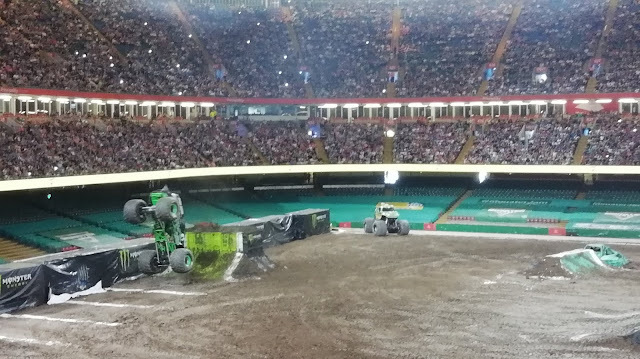 The remaining monster truck action was judged. 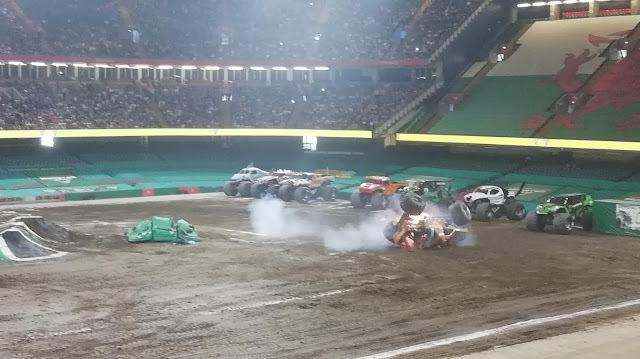 Unlike judged sporting events where professional judges score the action, Monster Jam® puts the scoring into the hands of the fans as you become the judge on your smartphone. 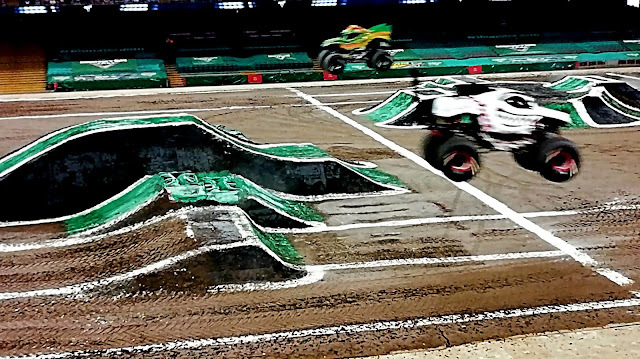 This unique style of judging reinforced Monster Jam®’s appreciation of its fans and made the show even more fun. The two-wheel skills challenge came next. 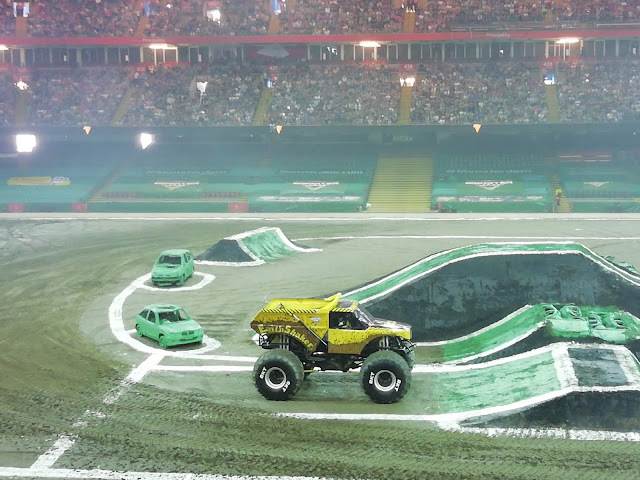 One after another Monster Jam® drivers showcased their skills to perform their best two-wheeled stunts. Each driver had two chances to dazzle with their best stunt then the fans judged their performance. Impressively the mechanical crew got Zombie and Monster Energy on the go again so they could compete in this challenge. The stuns were impressive and it is mind-boggling how the drivers manage to control such huge trucks to perform such impressive stunts on two wheels! After astounding, jaw-dropping stunts master monster truck driver Neil Elliott in Max-D was crowned the winner of the two-wheeled challenge. Following a brief intermission the Monster Energy Supercross motorbikes performed. The only tiny negative I can mention is that the smoke of the light show beforehand meant the bikes were not as clear to see as they could be. The motorbikes left me utterly amazed and with a strong desire for more dazzling supercross action. 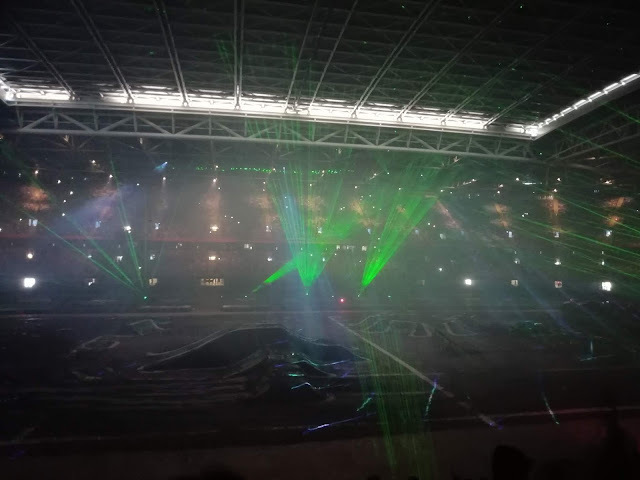 As a fan of motocross and having grown-up watching many motorcross shows with my uncle being an avid quad biker I’ve seen many motorbikes fly over ramps and race around tracks but this was something else, motorcross revved up to the next level of awesomeness. The heart-in-the-mouth, jaw-dropping action was spectacular. Bikes races around the track before speeding up a ramp and leaping in the air before landing safely. Mind-air the riders performed stunts; somersaulting the bikes, letting go of the handles and even laying down on the bike, all done at breakneck speeds. The supercross show was so amazing I would love to go to a Monster Energy Supercross Live show. Bring the show to an end was the Freestyle round. For two minutes each truck had the opportunity to perform their best stunts, jumps and saves which then get judged by the fans. One after the other each truck wowed as they flew 35 feet in the air over ramps soaring up to 130 feet in distance, performed two-wheeled stunts and even back-flipped. Some stunts were executed perfectly. Superb saves rescued other stunts. Whilst some stunts ended up in destruction. Parts of the fibreglass body of the trucks flew off as they freestyled. Earthshaker was left in tatters, bits of Zombie’s gruesome brain matter fell off which was quite amusing and Scooby Doo went up in flames. A mix of excitement and worry was felt as some of the trucks crashed which was then followed by admiration and joy as the drivers emerged from wrecked trucks unscathed. Battered trucks were abandoned all around the track after their freestyle performance. Fans cheered the destruction and bravery of the drivers, awarding them high points. Saved stunts and perfectly performed stunts also dazzled. It was impressive how many stunts each truck showcased in the time. The talent and showmanship of the drivers shone through. They each gave their all and delighted the audience with a memorable show. Grave Digger who mastered a superb backflip stunt wowed the most and won the freestyle competition. 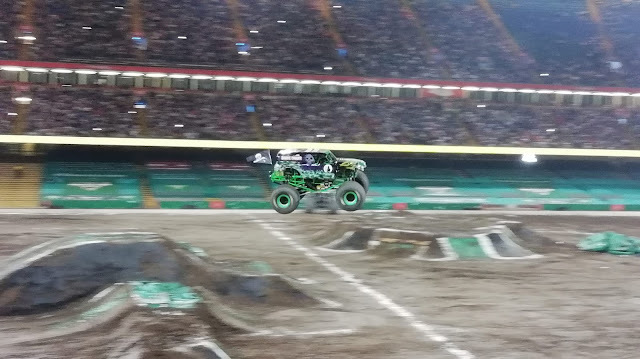 The show ended with a tie-breaker as Grave Digger and Dragon had both achieved 24 points, but in the end as he had a better freestyle score Grave Digger took the title and won! It was the fifth Freestyle Championship that Morgan Kane in Grave Digger has won and third Overall Event Championship of the season. The show was packed with other highlights. 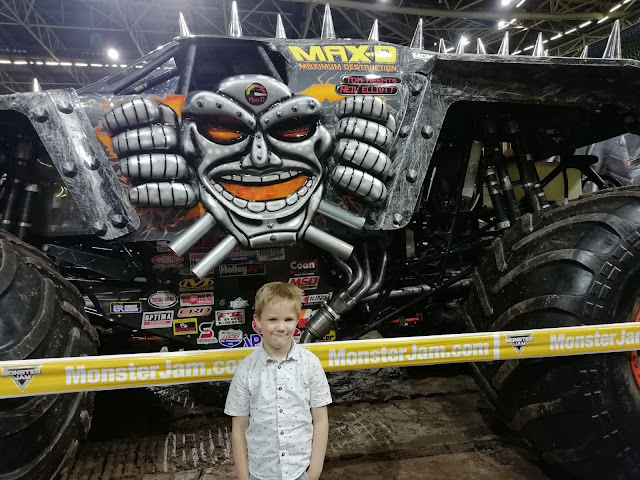 Peter Nyman in EarthShaker won his first Monster Jam® Racing Championship Neil Elliott’s two wheeled stunt victory in Max-D was his eighth Two-Wheel Skills Championship of the 2018 season! 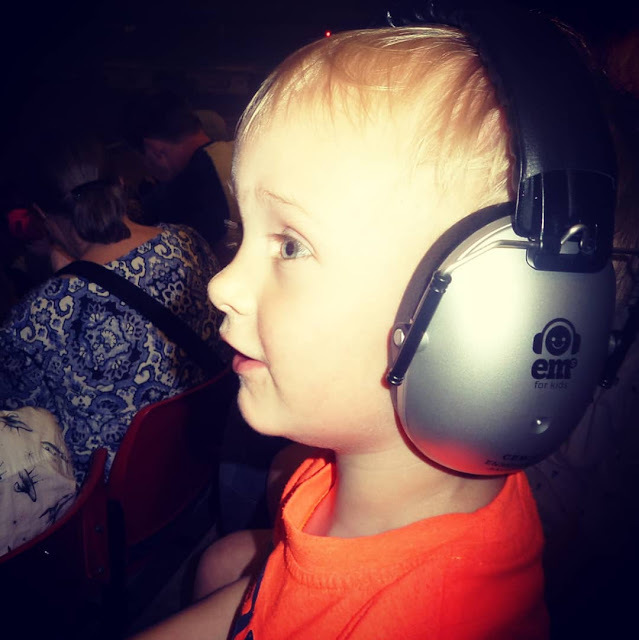 Following the advice on the Principality Stadium website about the show and the Monster Jam® website we made sure to use the amazing Ems 4 Kids ear defenders with the kids as did most of the crowd and I am glad we did as the noise was deafening. One thing I had not expected was the smell of fumes which gave me a slight headache but I am rather sensitive. It is incredible what daring stunts the brave drivers can achieve in such huge trucks. The beauty of the huge trucks is that there are no bad seats in the stadium because wherever you sit you can see all the show. It was also great that the show was so family friendly. Words cannot express how impressive the show was and it was epic family day out. 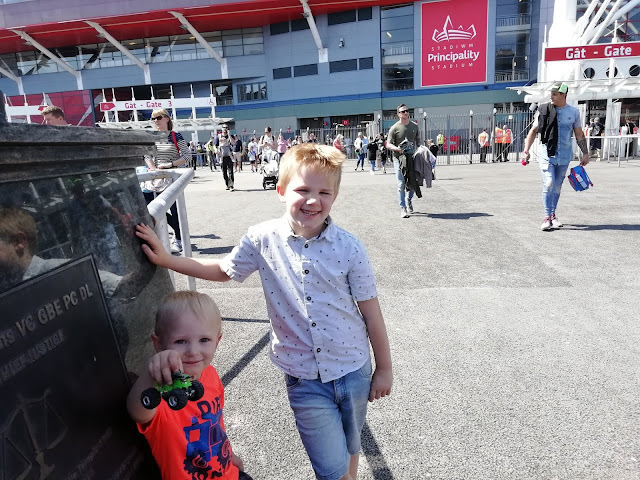 The boys loved seeing the monster truck action in all its glory in person on home soil, they were in awe of the trucks and drivers and are already begging to see them again. Seeing the wonder, joy and delight in my boys' eyes as they watch the show was magical and it is a family day out I will cherish forever. Have you ever seen a Monster Jam® show? Sign up to the priority customer newsletter to be the first to hear about future Monster Jam® events in the UK. We have and can’t wait to hear the news about tickets going on sale for when this amazing show from the legendary Feld Entertainment team come back to Principality Stadium Cardiff in May 2019!! Very interesting post! 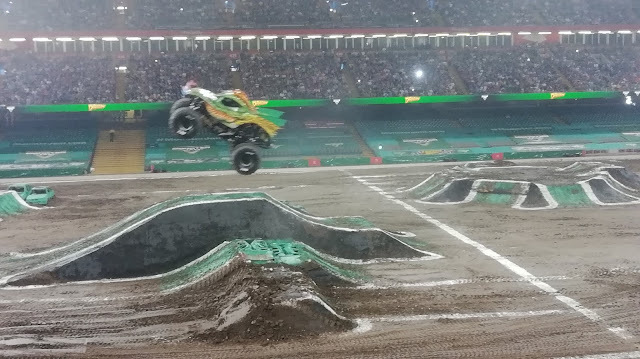 I don't live in the UK and haven't seen a monster jam show but I enjoyed reading about it! 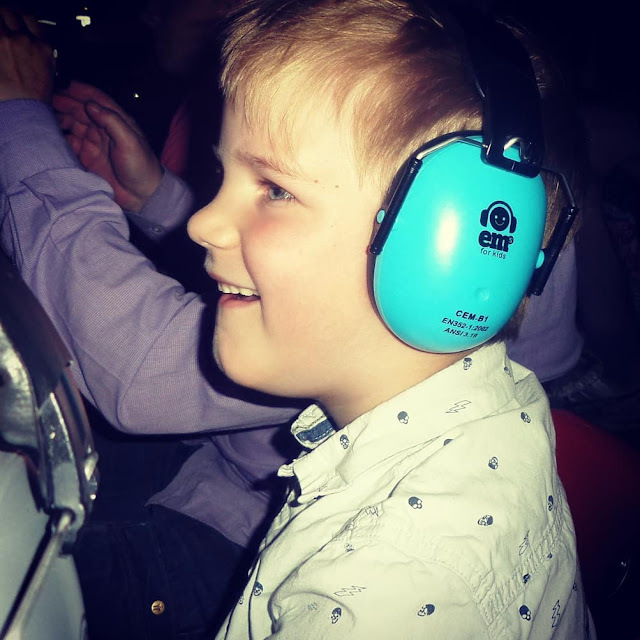 I had no idea that you could see Monster Jam trucks in person and live but that must have been a very happy experience for you and your family. And your monster trucks look even cooler in person as well! Its like so much exciting show...adventurous trip for you and your family..lovely pictures!!! This looks and sounds great. My car and truck mad 8 yr old loved looking at the photos. This just looks too amazing. Not sure this would have been my daughter's speed when she was younger, although who knows now. I know I would have loved it.